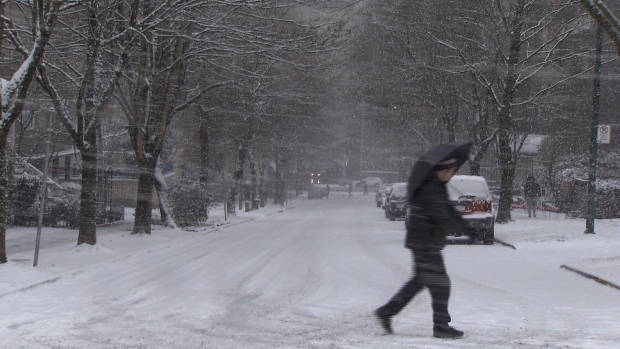 A man protects himself from the snow with an umbrella during the cold snap on the Lower Mainland. The cold snap that closed schools and caused commuter chaos across B.C. 's South Coast this week also contributed to record-setting electricity usage. Hourly demand for electricity reached 9,848 megawatts on Sunday night and 10,050 megawatts on Monday evening, according to BC Hydro. Both broke the previous record for hourly demand in February, which was set on Feb. 8, 2017 at 9,795 megawatts. BC Hydro said electricity use has surged by about 13 per cent on average since the cold snap started on Feb. 3, and tends to spike from 4-8 p.m. "when British Columbians come home from work, turn up the heat, switch on the lights, do laundry and make dinner." Customers can expect to see the increased usage on their next hydro bill – the utility provider said heating costs can rise by as much as 140 per cent in the winter months. BC Hydro recommends people adjust their thermostat based on their activities, setting it at 18 degrees while cooking or cleaning but lowering it to 16 while out of the house or sleeping, for example.